I had avoided watching Skint Britain - Friends Without Benefits for some time, as I knew it would likely upset me, since the story is quite close to home. I watched a close friend struggle for years on benefits, it's still too painful for me to write about fully, since my beautiful friend eventually died from a stress-related condition, but it really brought home to me how life and death the benefits system is. It's not just a decision whether or not to hand over some money, or how long for, there's so much more to it than that. It's people's lives. 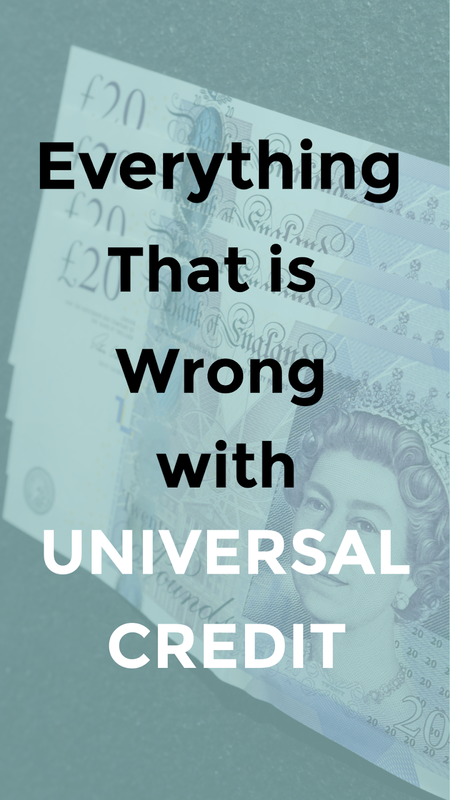 So I guess this post as been a long time coming as I have a lot to say about everything that's wrong with Universal Credit. 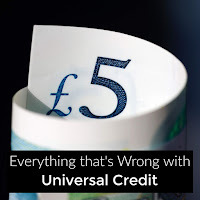 The problem with Universal Credit could begin anywhere, it could begin with the vast amounts of money the Government wastes on crack pot schemes like the Concentrix Scandal, and, of course, MPs insane expenses and wage rises. It could begin with zero hour contracts and the employees who pay their bus fares to get into work. only to find there's none available today. There's a lot wrong with a lot of systems to do with benefits and employment, so it's hard to know where to start, but I think the best place to begin is an ideology from Ian Duncan Smith, regarding one of the biggest changes that Universal Credit brings. His theory is that benefit claimants need to be prepared for a working life away from benefits and, since most employers now pay monthly, he thinks it would help them learn to budget if they receive monthly Universal Credit payments instead of their usually weekly benefit payments. There are several issues with this theory. Firstly, it is focused on the claimant finding work, which in some parts of the country seems almost impossible. For whatever reason, not all those looking for work are well educated, they may have slipped through the cracks for some reason educationally, they may have had a difficult time at home and not even gone to school, but good jobs for those who don't have higher qualifications are becoming much harder to come by. By a 'good job', I mean one that pays a regular wage. Zero hour contracts are becoming common place and these give you absolutely no guarantee of a regular wage, which is useless to anyone with mouths to feed and makes it impossible to budget, even if you did have accounting skills. Any contract that offers varying hours causes problems, because it causes your benefit amount to change weekly which makes budgeting a real challenge. Which leads me to my next point. Many benefit claimants live in areas of low employment, where benefits have become the norm for many families. In the show, one claimant said she didn't want the same for her daughter, but her job prospects were limited. In these circumstances, where the claimant could be a second a third generation service user, brought up in the benefits system, who is teaching them to budget? The benefits system is notoriously hard to navigate. It generally consists of a steady stream of ultra-confusing letters, telling you how much you get, which I, with A levels, cannot understand. The amount you get can change, if you don't have a fixed contract at work, or if you are off sick and then the amount of housing benefit you get changes as well. You also don't get very much, so it's very easy to get into debt, because in many cases it simply isn't enough to live on. Benefit claimants have the same lives as everyone else, so they are just as likely to have a sudden appliance breakdown or a letter from school about a school camp that can't be avoided without humiliating a child who doesn't deserve it. So budgeting is already virtually impossible, and now claimants are suddenly expected to handle a lump sum to pay their bills and day to day expenses, with no help or guidance on how to do it. Additionally, there is also a requirement to pay your own rent from this lump sum, rather than having it paid direct to a landlord. This is already leading to an increase in evictions from people who failed to manage their money efficiently and the knock on effect of this, is that fewer landlords are keen to accept a tenant who receives Universal Credit. So now we have a further strain on an already insurmountable housing crisis, by alienating landlords, when there are precious few alternatives for families living in poverty. And, yes, I do understand that it is there fault for not managing there money, but it's really, really hard. It's hard in any circumstance, but more so if you have limited education. I don't think the Government are fully aware of how difficult life is on benefits. The reason for this is most likely because they never hear about it. made to feel that they are just another number. TOUGH LOVE or just down right ignorance ! Hard to tell - the government really needs to wake up to real life !!! !